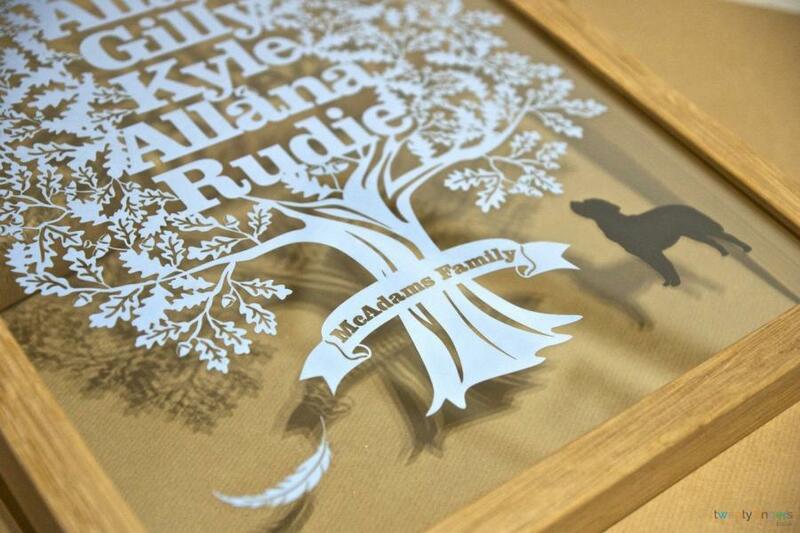 Personalised Large Family Tree Papercut in a Floating Frame. Gorgeous family present for many ocassions! 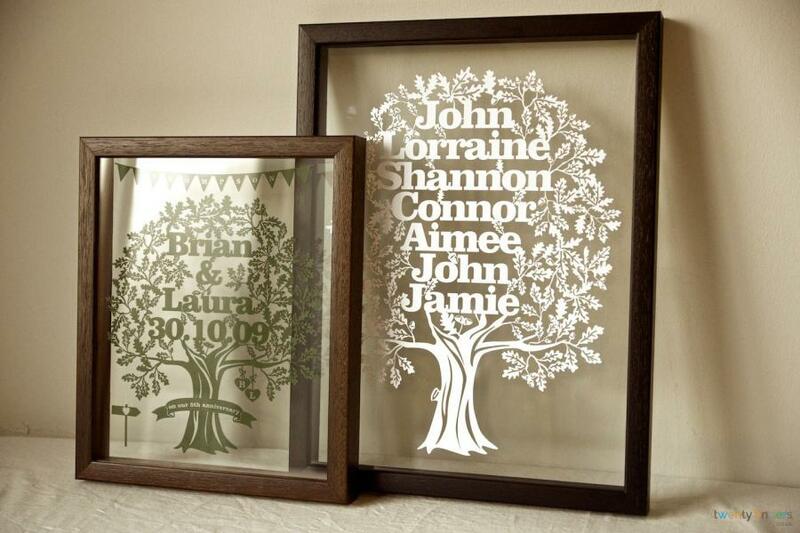 Personalised Large Family Tree Papercut. 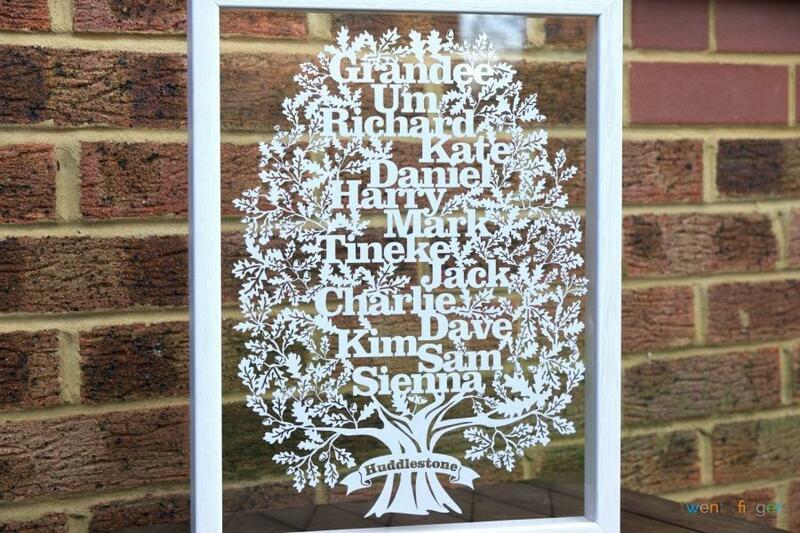 This gorgeous Personalised Large Family Tree Papercut would be an amazing personal gift or keepsake for any occasion. There’s nothing more important than family. 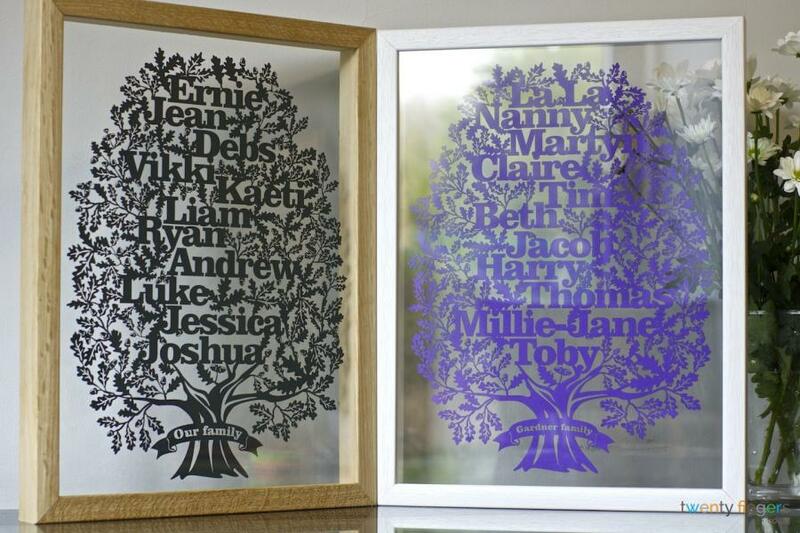 Our Large Family Tree Papercut is a beautiful and unique way to proudly display the members of the family, so will make a perfect individual gift for birthday, family anniversary, christening or wedding. Oak Tree is a common symbol of strength and endurance and according to legends stands strong through all things just like a true family. 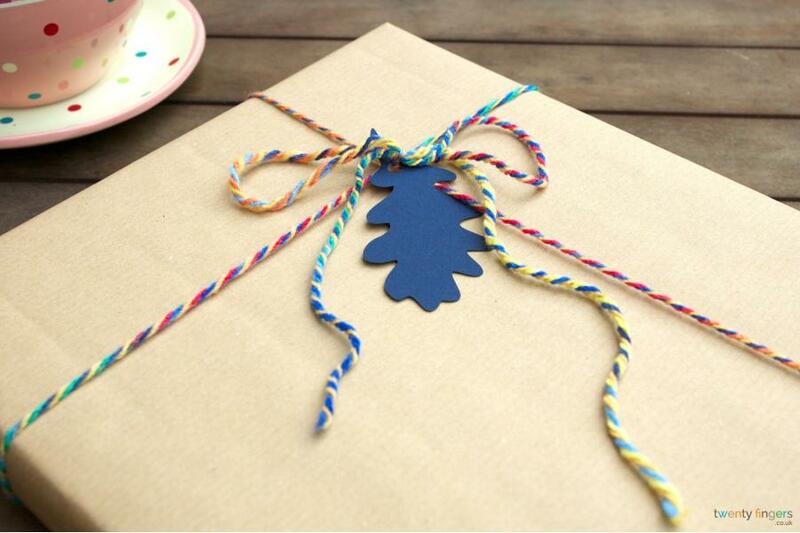 What makes it a great present for any occasion? Great gift for many occasions. 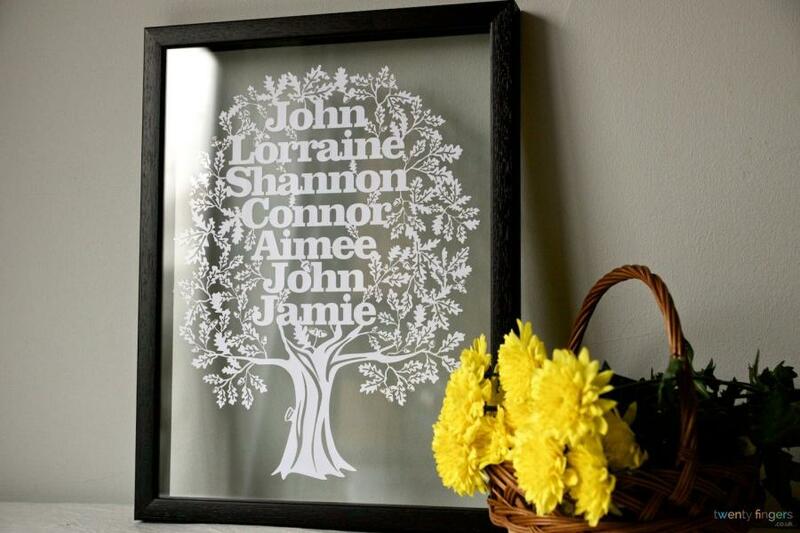 Whether you’re looking for a christening present, an anniversary present, or a gift that celebrates the birth of a new child, this gorgeous family tree papercut is the right option. 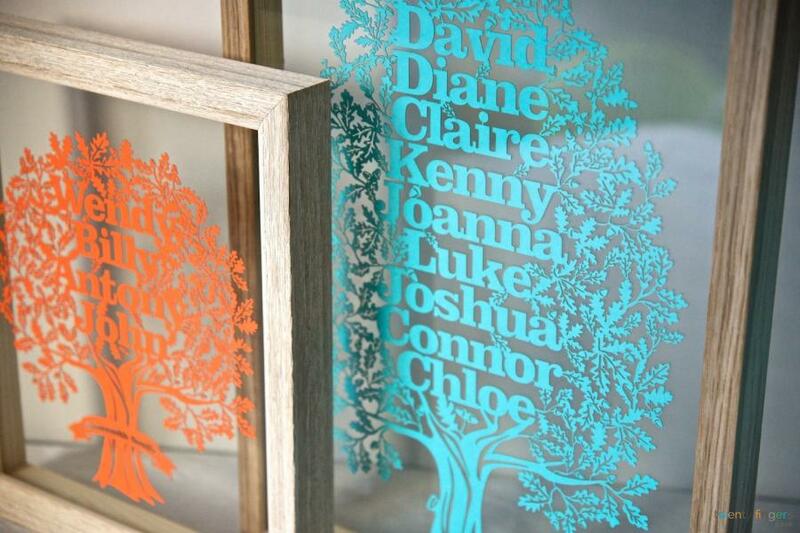 Personalised present – This is a completely unique gift that holds up to 9 family member’s names. It comes in your choice of over 20 different paper colours, 2 frame sizes, and 5 frame colours. 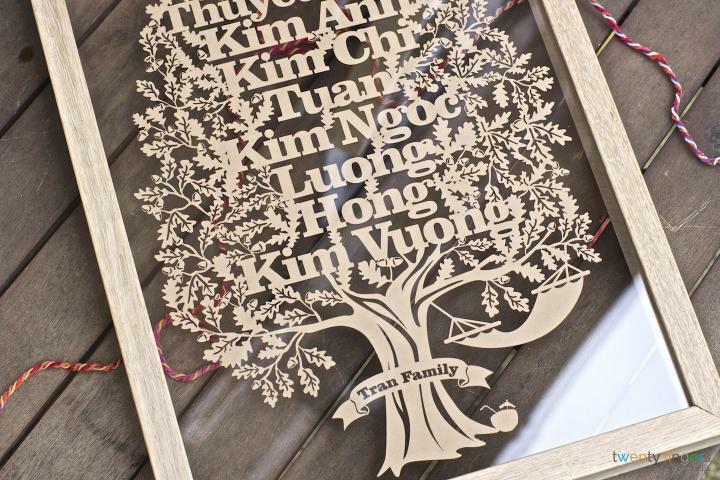 It goes with many types of décor – Because this family tree comes with many different colour and frame options, it can be matched for just about any décor. 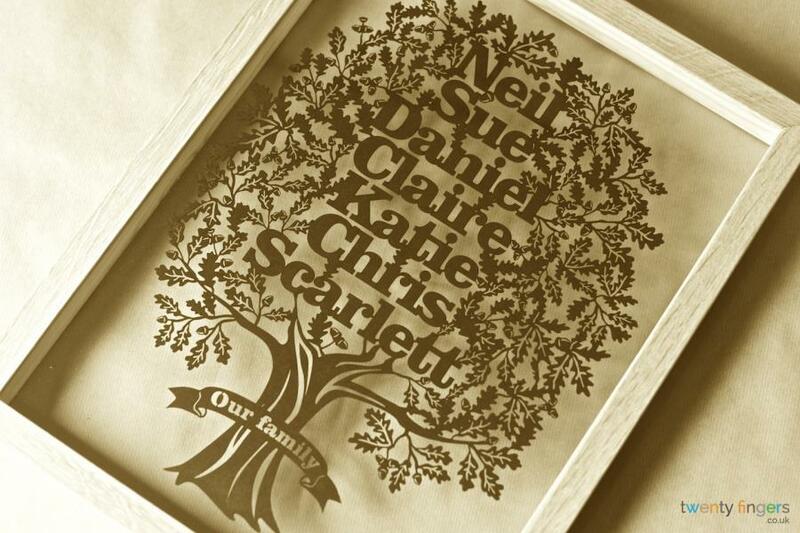 That’s why this family tree present makes such a great gift – there’s one that will fit in any home. “Floating frame”. Brake free from the traditional, common frames. 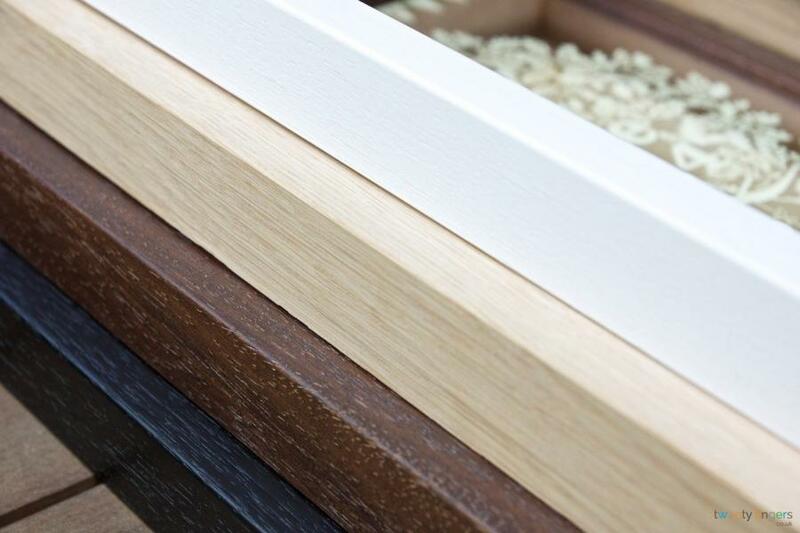 These frames are hand made in Buckinghamsire by our local framers according to our design and specifications. The family tree is sandwiched between two sheets of glass creating a magnificent floating effect. 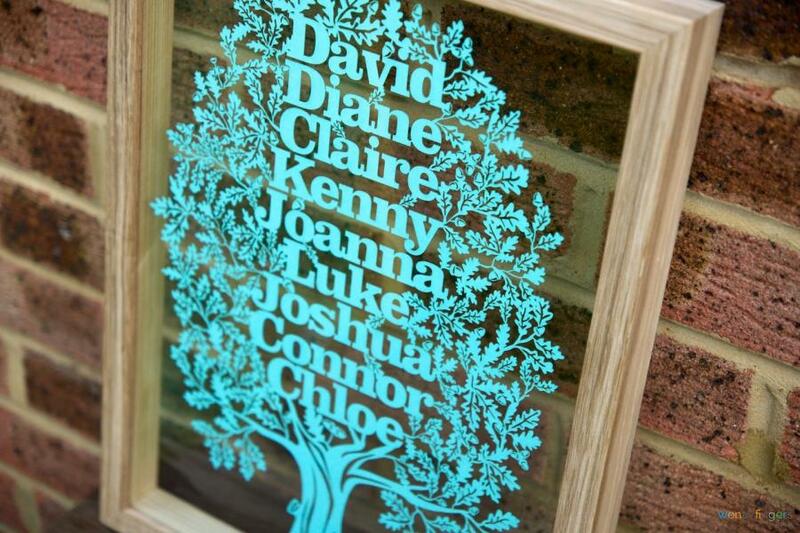 Large family tree papercut can be personalised with up to seven names. 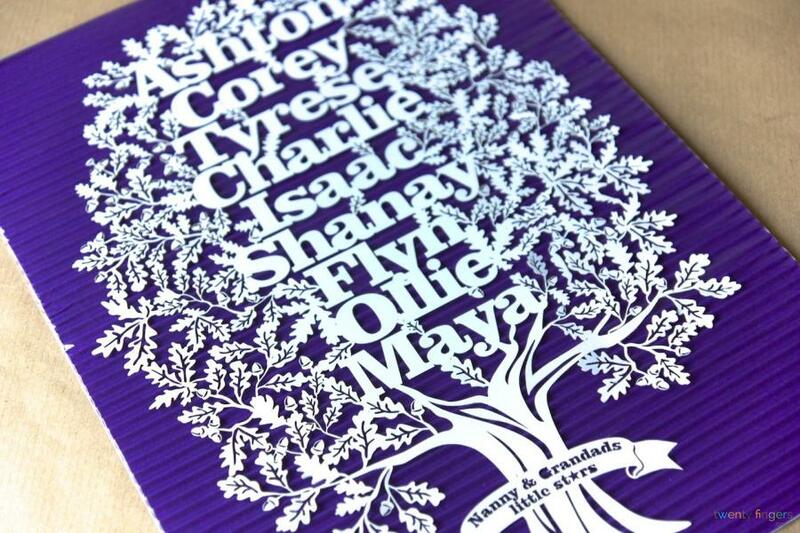 We recommend using up to 6 names with our standard tree and up to 9 names with this large tree and a “floating frame”. 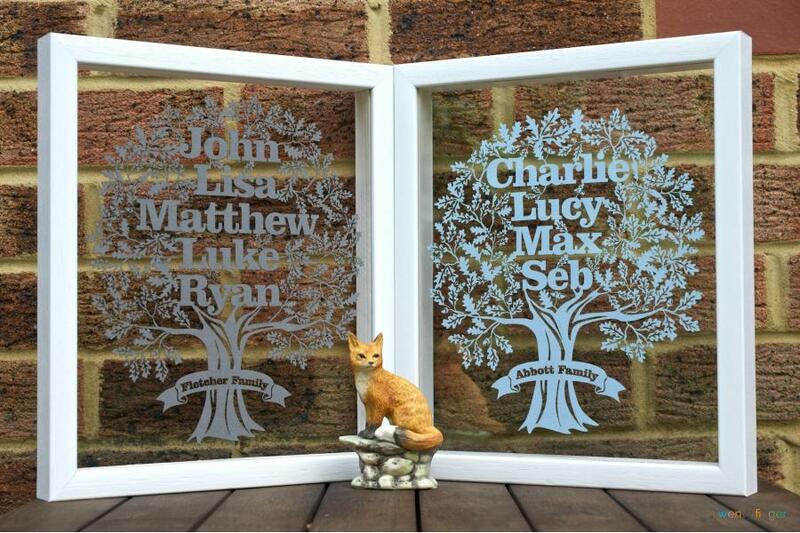 Choose the desired options: fill in the names, frame colours and preferred tree colour or contact us if you have any special requirements. 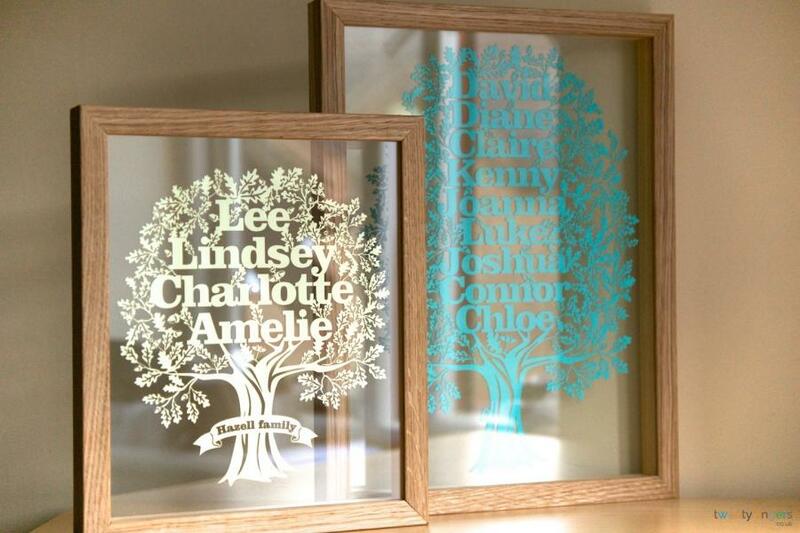 Large family trees can be ordered either framed or unframed. Unframed Large family trees are cut from a single sheet of 30 x 42cm (A3). Each family tree is unique and designed especially for you and the size of it depends on the names length and other details provided. 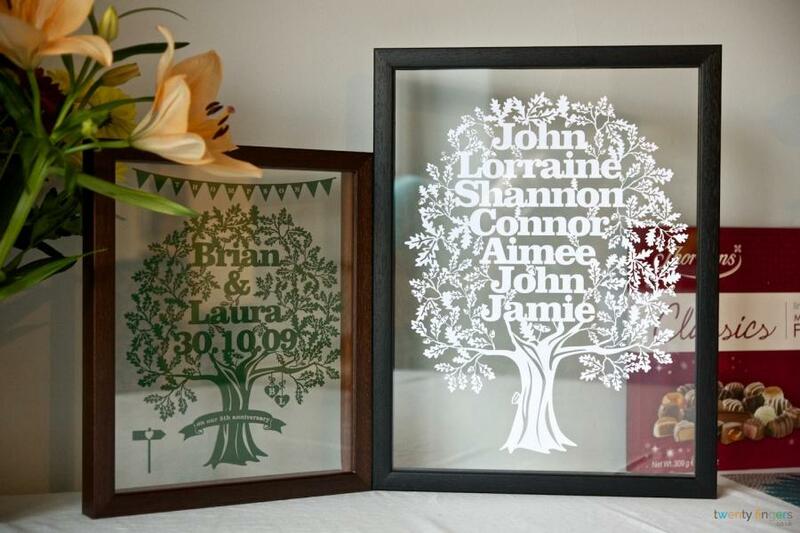 If you choose to have your papercut framed in one of our gorgeous hand made ‘“floating frames” it will be mounted between two sheets of glass and for Large family trees these frames are available in white or walnut effect. Large frame outer size is 36 x 44 cm and the inner (visible) size is 31 x 39 cm. 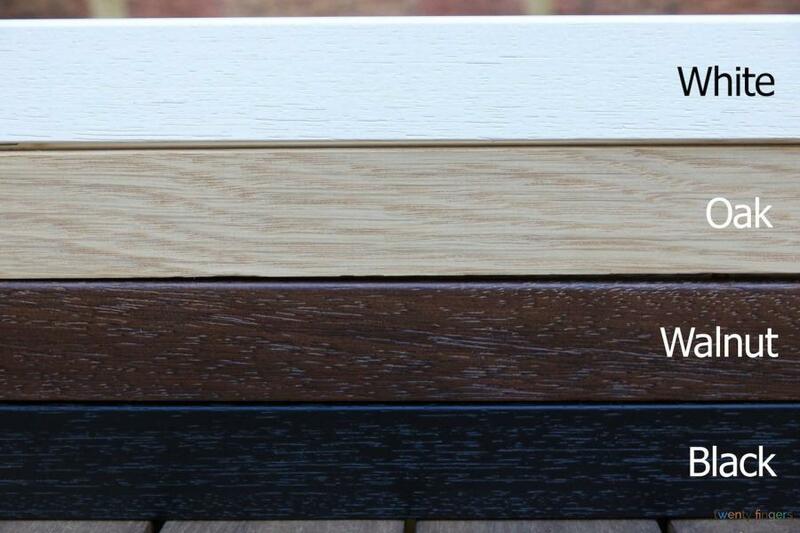 These frames are suitable for wall hanging or as freestanding artwork. 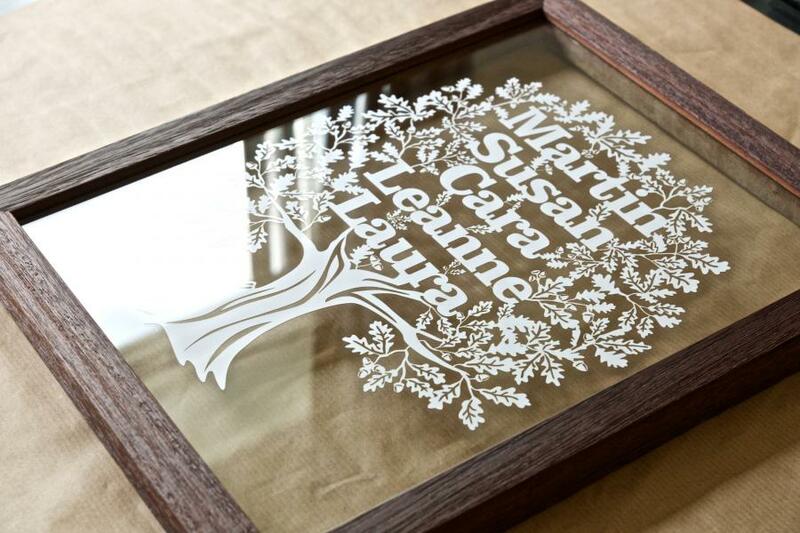 If you’re searching for a long-lasting family gift, this artistically created family tree papercut is an option to consider. Not only it is unique, but it’s a keepsake that can last for a lifetime for many generations to look at and enjoy for years to come. My large Family Ancestral tree arrived. It will go up on the central art wall. We ordered a family tree for my parents and they absolutely loved it. It was a very special and unique gift and once I ordered it online, I received it very quickly. Would definitely recommend this company! Only 25 names can be added to the Large family tree I would like to make a Family Ancestry family tree that can list Upto 84 names. Beautiful looking forward to receiving my gift.. Really excited to give this to my dad for fathers day. We are delighted with both the quality of our gift and the speed of service! Will definitely recommend this to our friends and family. 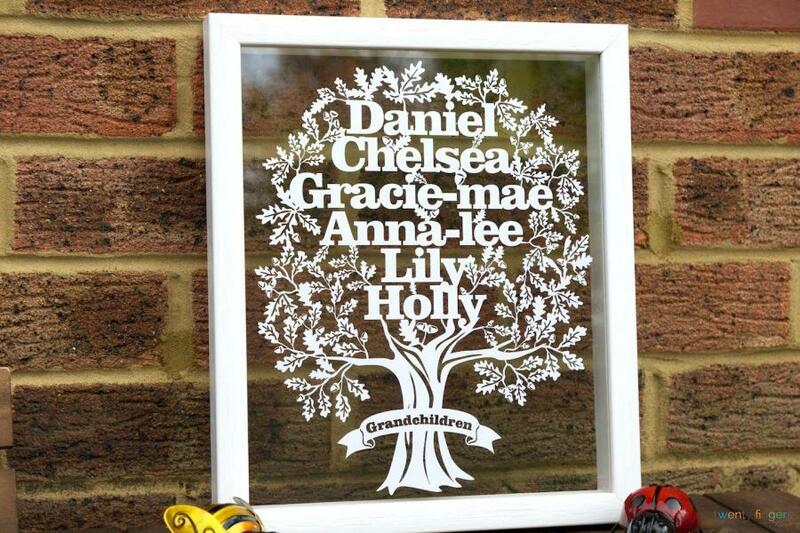 I have ordered a family tree for my mum for Mother's Day, it was a rather complicated order as I wanted hanging hearts with me and my 3 sisters names on with our partners names, then our children's names underneath. I wasn't sure it would work, but got the proof through and it was amazing and exactly how I wanted it. Thank you so much, will definitely be Ordering again and also recommending to my friends and family. Thank you again. My family tree arrived and was so lovely. Everyone comments on it when they see it. Great communication, really helpful when I decided to change my wording. Thanks so much for a fab service and good quality item. I ordered a family tree and it was absolutely amazing. Ordering was easy and the customer service was top notch. Parcel arrived really quickly and packaging was excellent. Really recommend this company and will definitely be using them again. Absolutely beautiful! It made a perfect Christmas present, and the recipients absolutely loved their present. I will definitely be recommending twenty fingers to friends and family members. Thank you for a stunning work of art that will be treasured. Ordered a beautiful large family tree for my parents, it arrived very quickly and is just perfect. Recommended! The tree arrived today and we love it! Thanks so much!